When I received the first report, I uninstalled the app on my Nexus Player (Oreo) and reinstalled it and guess what: same problem. In the meantime I received reports on Sony TV and Nvidia Shield TV. Yes, all trouble started with Marshmallow. 😉 I received reports on Nougat and Oreo and tested the app also on a Nexus 7 tablet (KitKat) and Pie phone. Unsurprisingly on KitKat no problem since no permissions exist yet, on Pie my phone showed a permission dialog to grant the permission (which is good, but still abnormal). Unfortunately, I have not encountered an Android TV rom yet which provides a user interface for granting the overlay permission (it’s not in stock android TV and none of the vendors seem to care). All reports were due to device resets, but as I already pointed out: simply uninstalling and reinstalling the clock app will exhibit the problem. Updating the app is no problem since it will preserve the previously granted permission. By taking advantage of this, I can test out a fix without impacting existing users. I did a quick search on the interwebs but no luck so far, it’s kind of a niche topic after all. 😉 I suspect a google Play Services or Play store update is the culprit but didn’t find any news yet. If it’s part of a security fix, information will be sparse anyhow. The reason it took so long is because I wasn’t sure how to provide a user-friendly user interface for selecting a color on a tv (using a D-pad). I now settled on the fixed palette and found peace with it since I will be offering a fine-tune option later on. So with the big fancy feature out of the way, what else is new? As a Nexus Player user, I was harassed by this nasty bug Google rolled out a few weeks ago which causes the remote to go to sleep at the worst possible moments, i.e. when you’re using it. 😉 It’s really frustrating when you’re trying to watch tv, but it’s even more frustrating when you’re developing an app. 😉 I tried using an emulator but my pc hardware is officially unsupported now by google’s emulator (missing some instructions). It’s time to replace this 8 year old rig, it served me well.. Anyway, I’m digressing. As a replacement for the bluetooth LE remote, I started using a Logitech gamepad. Unfortunately, it turned out to not emit DPAD_CENTER events required for adjusting size and position. From now on, gamepads should work just as well (use the “A” button to press “enter”). While I was at it, I added a notice about keeping the button pressed to reposition the clock faster. It seems some people have trouble moving the clock around and complain having to move it a pixel at a time. The input dialogs for repositioning and scaling the clock were originally stubs for a nicer UI but as a lot of things, it just stayed.. Might improve in some future version. The original plan was to have the clock run on as many devices as possible (also smart phones). So for a long time, the min api level was 10 (Gingerbread or 2.3.3+). I remember having a gingerbread device and often being annoyed by developers bumping the android version too early, effectively abandoning me from a functioning app (due to backend changes). I looked at the app stats and it turns out there are only 3 users below 4.0.3. I apologize, but no new version anymore for them. The bump is due to support lib requirements. I noticed sometimes the clock disappears due to high system load. Normally, the android system automatically relaunches the service afterwards, but sometimes this does not seem to happen. I’m not sure what’s the cause, but I added a trigger: when the service is destroyed by the system, it sends out a broadcast event just before dying to restart the service. Not sure if it will help.. When google released Android Marshmallow, they introduced a new permission model. I jumped on the band wagon too eagerly and as a result, the OnScreenClock app had become unusable on Marshmallow and up due to an unimplemented feature on Android TV. Complaining to google did not help. So I did the only thing I could do: release a new app targeting an older api. This app is known as “OnScreenClock Marshmallow” (a bit of a paradox, i know 😉 ). Recently, however, just when I was about to migrate all users of the old app to the new one, I discovered Google has relaxed their policy, so now the “old” app is good to go again! I guess it was causing too much trouble for users everywhere.. This is undocumented so I guess Google wants to keep that change low profile. 😉 This also means the future is uncertain, but that’s life, right? To all users using the “OnScreenClock Marshmallow” app, please migrate to the “OnScreenClock” app as I will not be further developing the “OnScreenClock Marshmallow” app anymore. After a long hiatus, finally an (unfortunately minor) release 🙂 Let’s hope for more in the near future. Or you get a visual indication in the clock widget. In the latter case, next time you open up the app, you will be presented with the changelog and the indicator disappears. The latter option is default since it is less obtrusive. In other news, you can finally change the text clock format to 12-hour notation if you wish so! Use left/right on your D-pad to switch between scroll and link mode. Use up/down to scroll the page/jump between links. 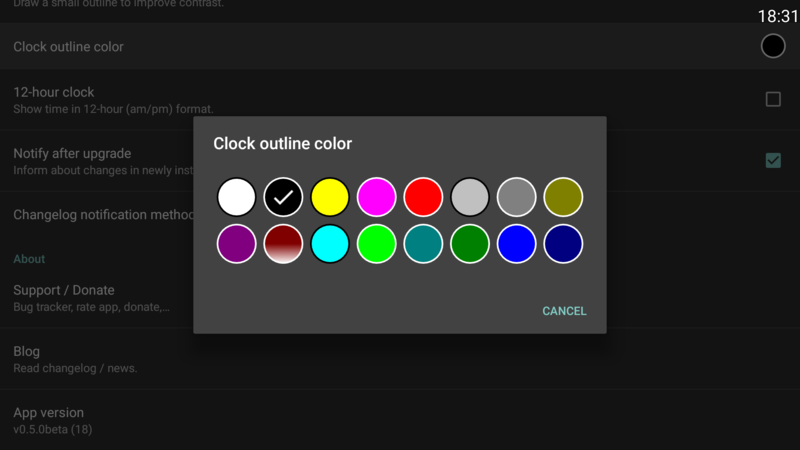 Please install the new OnScreenClock app as this one will no longer be developed and does not work on newer versions of Android (Marshmallow and up). The new app name is “OnScreenClock Marshmallow”. Sorry for the inconvenience. Marshmallow on Android TV does not support granting the overlay permission needed for this app, so I had to downgrade the targeted android version to Lollipop. However, google does not allow that for an app already published for Marshmallow, so I had to create a new app in the play store. For a more elaborate technical rant, read this post. Anyway, you might have guessed, the OSD clock app uses a special permission called SYSTEM_ALERT_WINDOW which allows it to create windows that draw on top of anything else. You might think (as I did at first): no problem, let’s just ask the user for this OVERLAY permission. This is a nice idea in theory, and it actually works on your average Marshmallow phone. Android TV would not be Android TV if they did not add something extra to the challenge. Indeed, all Marshmallow Android TV roms that I have encountered (to be honest, so far only Nexus Player and Nvidia Shield, there are not much more at the moment), do NOT provide a GUI for allowing the user to allow the app this permission. They do have a gui for dangerous permissions but not for “special” permissions! I guess we finally know now what makes them special. 😉 A bug has been reported (originally for Android Wear which suffers the same problem) but no response from google. So yeah, in case of my OSD clock app: no permission = no app. But wait, no problem, let’s just revert back to Lollipop target sdk and everything’s fine like Marshmallow never happened, right? Well, except if you already published a version of your app targeted for Marshmallow. In that case, you are not allowed by Google’s Play store to downgrade your target SDK. That’s really too bad. That’s why I had no other choice than to create a new app with a similar name and update the current app to show a deprecation notice, inform the users of the new app and hope they understand what to do. So, goodbye nice reviews and stars, goodbye established user-base… Congratulations Google, you win.